Holtz and the BHRC team are passionate about rebalancing and rejuvenating the whole person for inner and outer beauty using cutting-edge technologies like body contouring, Coolsculpting, laser therapy, HRT, medical grade peels and more. 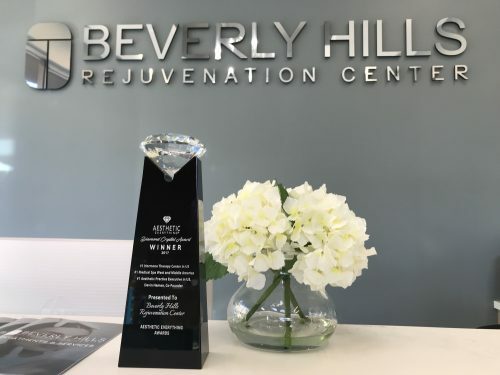 Recently earning the top spot among medical spas in America, Beverly Hills Rejuvenation Center (www.BHRCenter.com) is now named the number one hormone replacement therapy center in the nation, receiving the Diamond Crystal Award from leading aesthetic promoter, Aesthetic Everything. BHRC is known for its dedicated team of doctors and specialists, who work tirelessly to provide a full suite of unparalleled patient-centered age management services for hair, skin and body. Co-founder and hormone optimization expert, Dan Holtz, is passionate about the art and science of anti-aging, and has proven himself in the field of hormone replacement therapy. In his mid-thirties, Holtz experienced symptoms of declining hormonal health, but anti-aging science was just beginning to emerge, and there were no clinics yet available to help identify his condition and offer treatment. Holtz was not alone; by the age of 35, most men and women begin to show signs of a weakening hormone and immune system, and BHRC is here to help. In 2005, Holtz co-founded Beverly Hills Rejuvenation Center on the principle of maximizing health and wellness at every age, advancing the field of hormone replacement therapy (commonly known as HRT). Now, following decades of research and innovative work investigating and remediating thyroid imbalance, menopause, hypothyroidism, and a host of other hormone-related health issues, this award is a testament to the quality of his work. Holtz and the BHRC team are passionate about rebalancing and rejuvenating the whole person for inner and outer beauty using cutting-edge technologies like body contouring, Coolsculpting, laser therapy, HRT, medical grade peels and more. With twelve locations nationwide offering an impressive menu of innovative aesthetic and total body rejuvenation services, as well as a wide range of top-selling anti-aging and whole health products, BHRC has established themselves as one of America’s fastest-growing and most widely respected leaders in age management and wellness. Learn more about the center’s solutions for hair, skin, and body, and book a HRT consultation online at www.BHRCenter.com, or contact the Beverly Hills Rejuvenation Center located at 1856 Sepulveda Boulevard in Los Angeles at 310-473-5800.